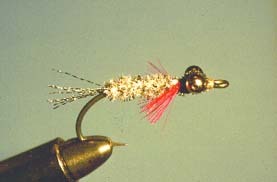 "Equipment Tips for Saltwater Fly Fishing"
Some fly tying materials like these bead chain eyes will rust in saltwater. Saltwater fly fishing has become the new horizon for west coast fly fishers. The incredible variety of opportunities provided by the five very different Pacific salmon species and the numerous bottom and midwater fish species has drawn fly fishers to experiment in ocean waters in recent years. The vast variety of species and the apparent limitless waters, fjords, bays, islands and tidal flats has lead fly anglers to these ancient waters as we enter the new millennium. For those starting fly fishing in saltwater there are many skills and numerous equipment difference that need to be considered. But, there are also many that overlap. The following recommendations come from my 30 years of walking Pacific Ocean tidal flats, boating to hidden fjords and bays, anchoring above underwater structure and fighting tidal currents and wind drifts. Heavy powerful salmon will stretch leaders making a change necessary. These tips work for me and have added immeasurably to my days in saltwater fly fishing environs. Come prepared! A spare fly rod should always be readily available. These are big fish and rods will be stressed to the maximum. When beach fishing, have two reels loaded with a floating line and a 'wet-tip' for quick changes depending upon the condition of the water (colour) and the activity of the fish in shallow waters. When boat fishing, have three rods set-up with a floating, a 'wet-tip', and a fast sinking fly line. Stripping Guards are mandatory in saltwater to protect your stripping finger while retrieving your fly line. A fine flotsam of sand and grit clings to your fly line on every retrieve. It is extremely abrasive and quickly cuts through skin to expose raw flesh. Peterson's 'Stripping Guards' or 'Band-Aids' should be placed on your stripping finger prior to each day's casting. As well, when a large powerful fish strikes, it is not possible to react quick enough to release the fly line in your stripping finger with the result that a deep rope burn will result when the fish tears out clinched fly line. 'Stripping Guards' also help to clean your fly line as it is retrieved, making for longer casts, and, a longer life. 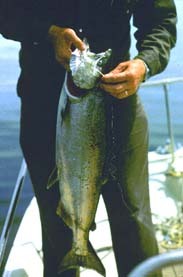 Fly fishing vests are excessive equipment when saltwater fly fishing either from a boat or while beach wading. Most are too long while deep water beach wading and wick or soak up water. One solutions is to use the high riding chest packs to carry only necessary equipment. Vests worn while you are on a boat are cumbersome and heavy. Rather, organize your boat to have necessary equipment like scissors, leader and flies quickly available. Peterson�s �Stripping Guards� are comfortable lycra finger sleeves which reduce finger to line friction, stripping cuts, and continuously cleans your fly line. Use a single large fly box on your boat so that you are not constantly searching for particular flies. These large boxes allow a full display of patterns and sizes, and, because they are visible, you will not forget that special fly that you know will take fish. On the beach, use a single flat fly box with a clear cover. This easily slips in a pocket or a chest pack. Additional and spare flies can be carried in Zip-Loc bags which easily fit shirt or coat pockets. When beach fishing chest waders are a must for the long hours you will be standing in a cold ocean. Wading gear should be boot insulated and thick to keep you warm and not skin tight. My preference is for loose boot waders to keep the warm body air circulating. On a boat I recommend high lightweight Gortex 'hunting' boots to stand in. Gortex keep your feet dry even during the hottest Pacific Northwest summer day. High laced boots provide a strong ankle and leg brace for those long hours you will be standing and casting. Thick back bracing belts should be used when you plan long hours wading cobblestone or loose sandy beaches. These back braces also work exceptionally well for those long hours you will be standing in a boat casting. I would estimate that this one unit alone adds two hours to my day's fishing particularly when I am fishing day-after-day-after-day. Reels should always be cleaned after they have spent time in saltwater. A lightweight powerful binocular is very useful when you first reach a beach fly fishing area. With it you can spot jumping coho 'jacks' and pink 'locator' fish along the beach and then plan your approach to these fish. In the boat strong binoculars are invaluable as a hunting tool when you are searching for bird activity or even leaping salmon. As well, always wear sun glasses even on dark overcast days. It is amazing how these add to the pleasures of a day's fishing as well as protecting your eyes. Marine charts and tide guides are indispensable for both beach and boat fishing. With them you can plan your day's fishing to coincide with ebbing, slack or flooding tides in those shoals where tide movement has a decided affect on fish behaviour. I also recommend that you have a set of sunrise and sunset times for the area you will be fishing. These allow you to fish every possible moment and still plan for the long boat run back to the launch. 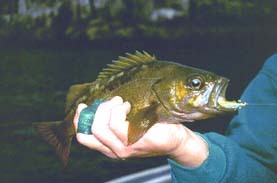 In some beach locations tidal floods and ebbs play a significant role in fish movement close to shore. In my many years of beach fishing I cannot say that an ebbing or flooding tide is the best. The only regularity depends upon the school of fish present in the area. 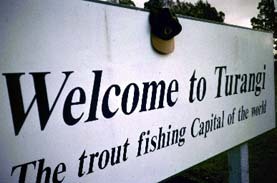 Once you have determined that behaviour be prepared to capitalize on it during subsequent days fly fishing. Saltwater fly fishing tackle is compatible with freshwater tackle in most situations except for reels and hooks. Saltwater is extremely corrosive and will rust hooks in minutes. I make a point to tie all my saltwater patterns on stainless steel hooks and even then make certain that the fly is dry and clean before I return it to the fly box. It is important to note that even some materials used for fly tying will rust when exposed to saltwater. Be Warned! Most modern reels have been treated to protect them from rusting - BUT - if you plan to fish regularly in saltwater purchase reels that are saltwater proof. Even then, do wash your reels regularly in freshwater to clean away corrosive salt buildup. Fly fishing equipment is very personal to each fly fisher. The suggestions above are those of a general note that have greatly improved and enhanced my saltwater fly fishing experiences. 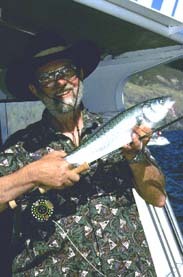 An email message I recently received from a Fly Fishing club member where I did a presentation on saltwater fly fishing did much to help me pen this article; "Barry," he wrote, "Your talk on salmon fly fishing was highly enlightening but, what I enjoyed the most was the practical equipment tips you provided. They have added much to my fishing and lengthened my days on the water. Thank you."